Turning your sentimental trash into useable treasure! Organizing tips from a girl with a LOT of practice…:D.
Since moving home ‘again’, I’ve been trying to re-organize, prioritize, and energize my space. I have more furniture than my half of a room can fit, and my ‘hope chest’ that contains enough to start my own mansion isn’t needed in an already furnished house. #1. 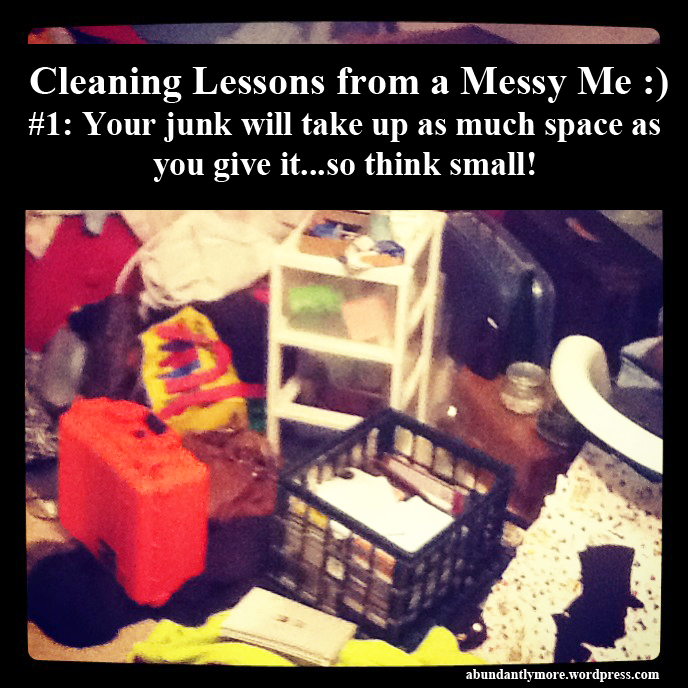 Your junk will take up as much space as you give it…so think small! Think small as in storage, as in furniture, as in nick nacks, as in crafts and hobbies…if you have a space to put something, you definitely will! The only thing you need to think big on is your give away box! So, join me as I learn how to downsize my “precious valuables”, find better ways to display them instead of store them, and make my space Abundantly More! DIY: Clothes Hanger to Plate Hanger!